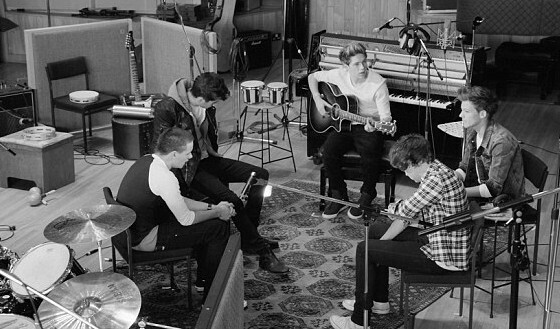 One Direction Recorded Little Things By Accident! In many ways, Ed Sheeran is kind of like the honorary sixth member of One Direction. (No offense, Drew Brees.) And while his vocals are nowhere to be found on the band's sophomore album, Take Me Home, his folkie presence is. That vibe is felt on the band's current single, "Little Things," which has quickly become a 1D fan favorite. But, even the band's loyal fans might be surprised to learn that the group hadn't even intended on recording it when they first hit the studio with Sheeran. "That one actually wasn't one of [them] we were supposed to be recording," Harry Styles dished to MTV News. "We went in to record a different one of his and he said 'I've written something else if you want to hear it'... he wrote it and then played it to us in the session when we were supposed to record something else and we said 'All right, we want to record that now.' "
From there, the track was born, and the guys have no regrets, especially considering they consider it their first-ever real entry into the world of love ballads. The track, as the title might suggest, focuses on the perfections and flaws that make the special someone the song is about so loveable, tight jeans and all. It was that subject matter that drew the boys to the slow jam.
" 'Little Things' is our first proper ballad, so it's great that they love it and that we've done a great job because the ballads the real important thing," Liam Payne explained. "We're really happy with it as well because boy bands have done ballads before and this song's really different for a boy band," Zayn Malik added. "It's just all about the song, the lyrics and getting the emotion across. It's not sad, it's more about falling in love with somebody." In addition to the sugary sweet ballad, Sheeran also gifted the guys with the mea culpa slow jam, "Over Again," on the album. So, what is it about Ed Sheeran that the guys love so much? "He's just such a good songwriter," Liam said. "He comes up with amazing songs 'cause we're such big fans of him. We just think he's wicked, so whatever songs [he's come] to us [with, we use]." But, hitting the studio with Sheeran can prove to be a bit of a logistical nightmare, as it adds an additional person to five-piece boy band. But, they've found a way to work out those sessions. "The thing is, if you have us and Ed — six people trying to write song — not everyone [is] going to be the same way," Harry explained. "It's kind of hard, so it's usually split up between three and two [people]. The songs that are on the album that he did, he'd written and when we're there, whoever's not like in the booth, everyone just kind of jams and comes up with ideas." Back in the summer, MTV News spoke to the red-headed songwriter, and he explained what inspired the two tracks on the group's album and what drew him back to the group after working with them on their debut album, Up All Night. "Seventeen-year-old Ed just wrote a lot of love songs, so expect to hear a lot of love songs on their album, I guess," Sheeran explained. "I had a wicked girlfriend at 17. ... She was great. Actually [my] + album is pretty much about her," he went on to reveal. "So she spawned off a lot of songs." What do you think of Ed Sheeran's songs on Take Me Home? Tell us why you like them in the comments!